Giraffe and Fox by Isabella Chebet is a creative retelling of a traditional village story by our Daylight 8th Grader Isabelle Chebet! 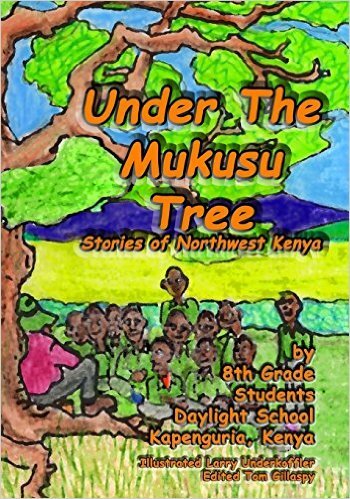 It is one of many in “Under the Mukusu Tree” a collection of stories written by our 8th grade students at Daylight! Long, long ago there lived a giraffe and a fox. They were good friends. Whenever they got time, they would sit under a tree near the stream and pass the day happily talking on different topics, telling jokes and really enjoying each other’s company. One day, when Fox was roaming around, he saw some beautiful, ripe grapes growing on a farm on the other side of the stream. Unfortunately for him, the stream was wide and deep, so it was not possible for him to cross. The following day, Fox met Giraffe and told him about the sweet grapes he had seen on the other side of the stream. Giraffe agreed to take Fox across. After crossing the stream, Giraffe and Fox trotted into the farm and started eating grapes. Fox gobbled down many grapes very quickly and then patting his full stomach, declared that he was so satisfied he must sing. Fox paid no attention to his friend’s advice. Right away, choosing his favorite song, Fox began to sing. Well, it wasn’t long before the owner of the farm heard the music and came rushing over toward them with a BIG STICK. Fox was the first to see who was coming and ran quickly out of the farm, through a hole in the fence. But poor Giraffe was slower to find a way out and when the owner of the farm arrived, he found only Giraffe at the scene of the crime. 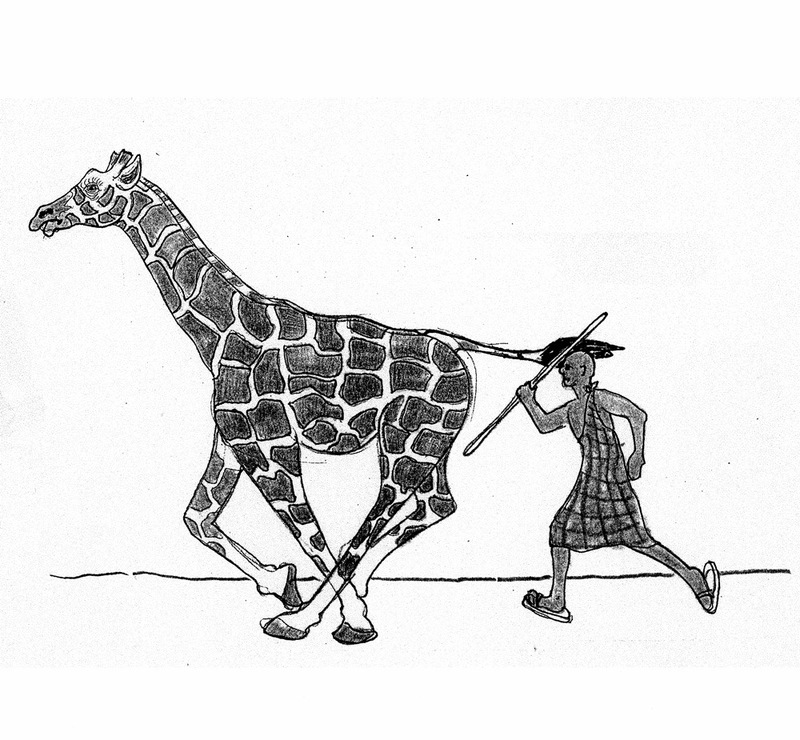 He beat poor Giraffe until he broke his stick. When Giraffe was finally able to limp away from the farm, he went to where Fox was waiting for him at the edge of the stream for a lift back to the other side. But just as Fox had done in the farm garden, Giraffe paid no attention to what Fox had asked. Right away, he bent his knees and started rolling all around in the water. Poor Fox could not swim, so he sank into the stream and was never seen again. Read more stories in “Under the Mukusu Tree” ! Daylight co-founder and U.S. Director Nathan Roberts will be speaking alongside Rael Kakulima of Tanzania at the University of Minnesota Humphrey School. They will be leading a discussion on African and American Conflict Resolution at the 2016 MINN IDEA Summit in Minneapolis on Friday, October 21, 2016. The theme of the fourth annual MINN IDEA Summit is Reimagining International Development: Defining Purpose and Success. The Summit aims to host a dialogue on how international development techniques are changing to keep up with a changing global landscape and how goals are being reevaluated and successes are being measured and analyzed. The IDEA Summit explores topics such as community engagement, conflict resolution, building corporate partnerships, building capacity, creative funding mechanisms, communication and new development trends. In addition to breakout sessions, networking with like-minded practitioners will be a large component of the day. Register here for an opportunity to hear Nathan and Rael Kakulima and a host of other great speakers on international development! The nomadic tribes of the Kenyan desert are storytellers. Before my friends had the chance to go to school, we learned as we lived. Our first classrooms were the hills we walked with the cows, the cooking fires where we boiled sweet camel milk, the rivers where we filled our dried squash. Babas and Kamas – or as we say in English Moms and Dads – told us stories of the how the Sun and Moon wrestled to decide who would be queen of the sky. The elders would gather the children around the fire to tell them about how the Fox and the Giraffe got caught stealing the farmer’s grapes. We are so proud to present “Under the Mukusu Tree” a collection of stories written by our 8th grade students at Daylight! The students wanted to write down these stories so that future generations can read the stories they learned. 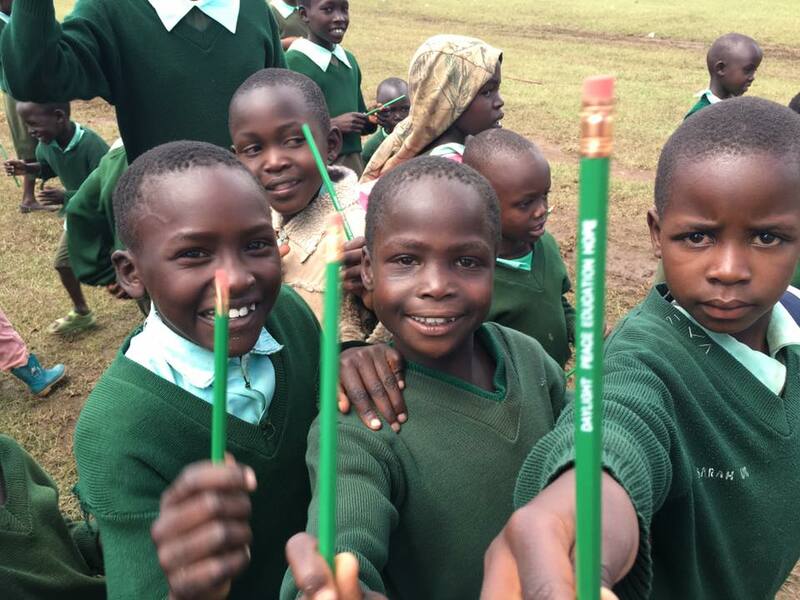 It is quite a gift because these stories are changing as life in Kenya is changing. More and more children are spending their days learning inside classrooms studying reading, math, and science. They are growing up to do jobs like bankers and lawyers. So they wanted to put together these stories so that the values the village will go with them into their new jobs. These stories teach us honesty, community, and respecting your elders. Now you might notice that some of the stories are set in a traditional village and others are set in a city and some are set in a formal school setting. This is because our students wanted to add new stories they have heard while living life in the city. 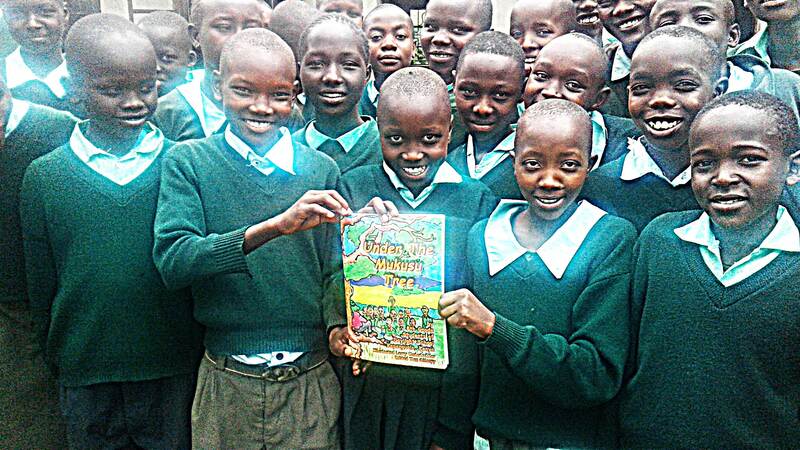 Stories that have helped our students translate the village values into 21st Century Kenyan life. This is how our village adds stories. When elders from other tribes came to visit they shared stories from their village and some of these stories were retold to our children. As each generation comes of age, they retell the stories, adding new details to make the story come alive to the next generation. Our community trusts the wisdom of the elders in each generation to translate the values. Who knows? Maybe someday we will have a story about how the Phone learned about the Internet! Daylight 8th Grader’s Collection of Stories “Under the Mukusu Tree” is Available! The stories are mostly traditional stories of the Pokot, Turkana, and Karamoja tribes of northwest Kenya. Many of the stories involve animals like elephants, lions, leopards, ostrich, hyena, and giraffe with which the students are familiar. 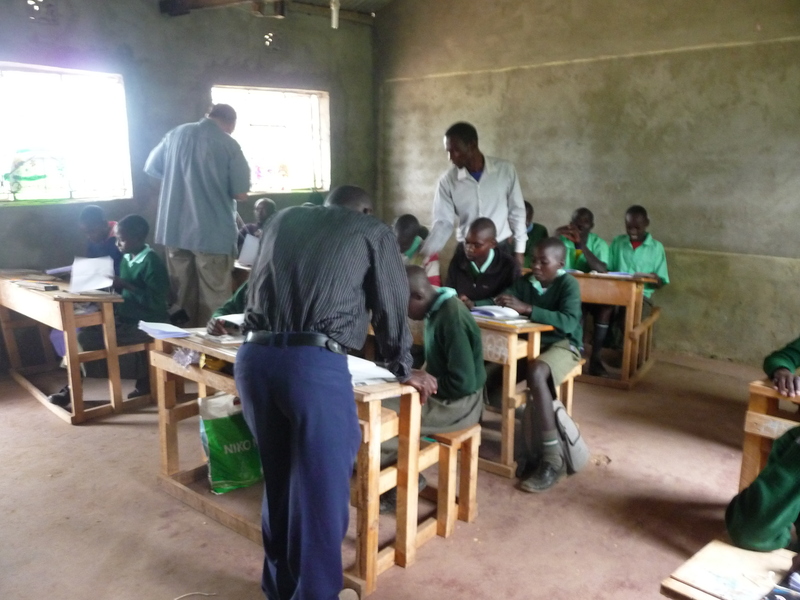 In Kenya, students take a test, much like the college entrance exam in the US, to determine whether they can continue their studies in high school. Part of this test is writing an original story which is graded on English spelling and grammar, penmanship, and creativity. Tom Gillaspy and Larry Underkoffler were asked by Michael Kimpur, the founder of the school, and headmaster Eliud Mungoma to work with the students on creative storytelling. This is the product and yes, the class sat under a giant Mukusu tree. Writing the stories of the nomadic peoples of northwest Kenya on paper will help to preserve them and parts of the culture. Little has been done in preserving these stories. This is a start. Hopefully, more stories will make the transition from verbal only to also appear on the printed page. The lives of the traditional peoples of northwest Kenya are changing rapidly. If the stories are not preserved soon, they will be lost forever. Most of the students of Daylight School are orphans, largely resulting from inter-tribal violence. Daylight School accepts students from all tribes and religions and is changing the dynamics of the area, creating a whole new tribe.